narcoleptic in a cupboard: Charmed I'm sure, I-spy in a Low Volume vibe. It started like this... 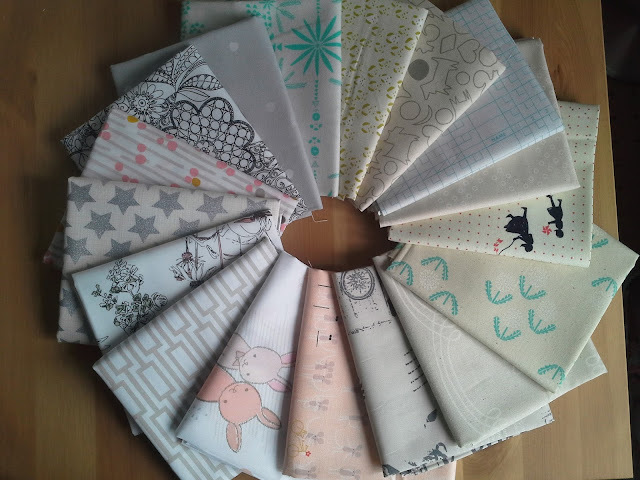 I've been amassing Low Volume (usually the most required fabric in bee & swap blocks!) for a few years now, and keeping my favourites separate. 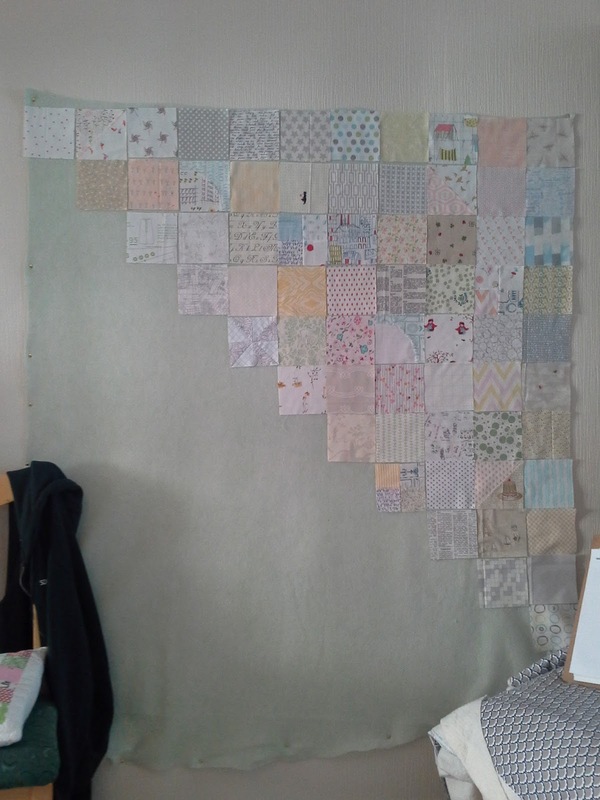 The very top right of this picture is a stack of charm squares, all different. This summer, I finally had a concrete vision in my head of what I wanted to do with them! It took me about 3 weeks to do all my cutting. Thats how tired and crappy I was over summer... But when everything was cut, I had the urge to sneak in a few wee blocks too - the odd drunkards path, a four square here and there, a random pinwheel or two, and the ubiquitous Half Square Triangle. But keeping to a minimum so as not to be obvious. Cos you know subtlety is so me... I also decided to have it On Point. 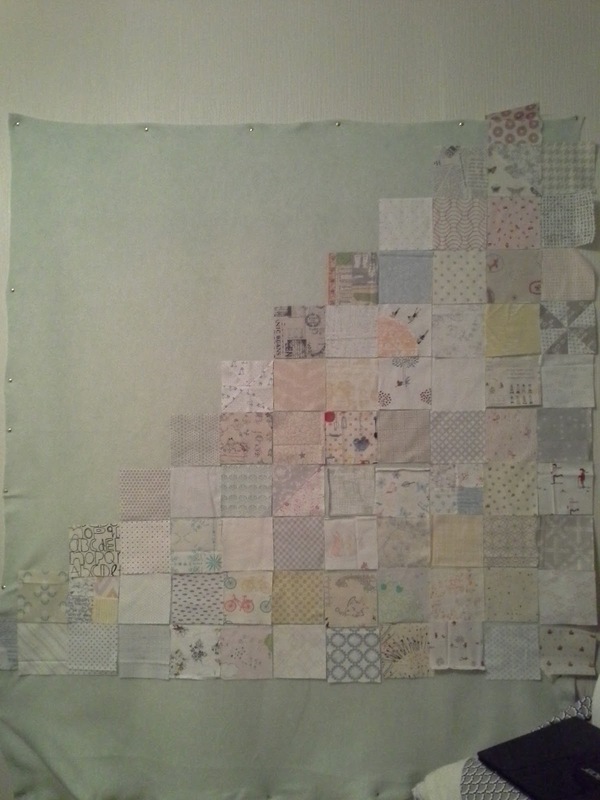 I counted out what a quarter would look like, chucked it on the wall, and with Supergran to assist, I got 4 mornings sewing, three hours a quarter. This was a biggy in my books. 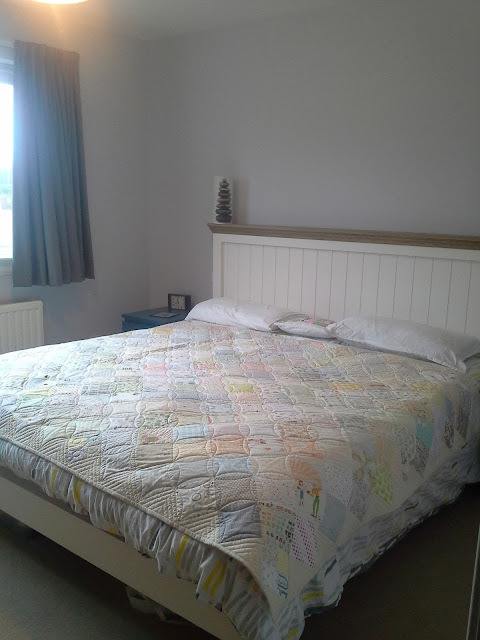 Our new bed is a whopper (well poor man does have to share with me and my 101 symptoms of sleep disorders and hip pain...) so this had to fit. (and it does, just!). There was no way I could quilt it though, and you know, I'd never in a million years have done it justice. I handed it over to the only woman who would. Ms Trudi Wood. She's not just a fabulous quilter. She's a friend. 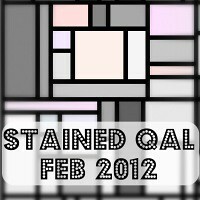 She is kind, thoughtful, creative, AND a fab quilter! I explained my quilt to Trudi. I told her how much I loved it already. 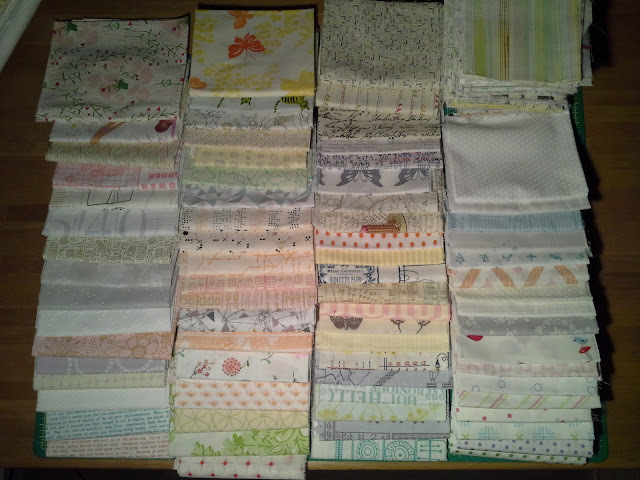 I told her that every print was different, and so many of them said so many different things to me. I can remember which were used in who's blocks. I remember which prints were given to me by friends. I can spot right away the prints which came from the first swap I ran. And then there are the prints I included for Moo. You see, this quilt will be on my bed. 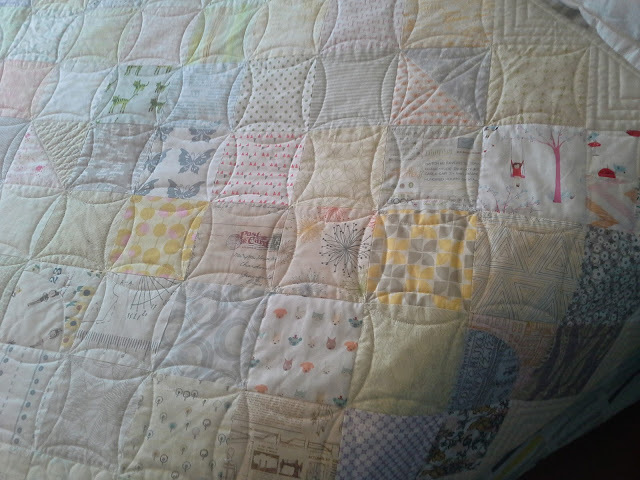 As Moo grows up, this quilt will be on my bed and no doubt she will join me snuggling under it. When Moo has a bad dream we will cuddle under this quilt. When Moo is feeling poorly we will snuggle under this quilt. There are many, many I-spy squares included for the very purpose of distracting Moo! Anyway. 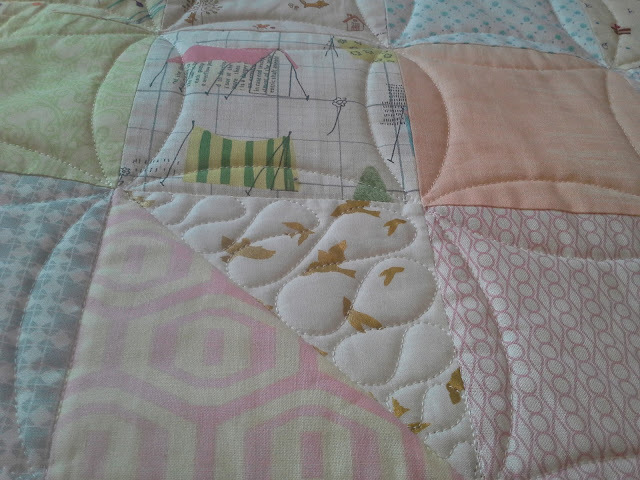 I told Trudi everything, and she told me how she could quilt it. "an all over with a few things hidden in for fun". What can I say. She gets me! She understood completely. I knew she was the only person who could or should do the quilting for this quilt. And she excelled herself!!! Here it is. As usual my photos are awful but I'm including so many I hope you'll get a feel for it. Coming in under 100" x 80" it still looks small on the bed! You can see the all over pattern though, and I'm happy that no one part of it stands out more than the other. And this is how the little differences pop up! Gold Birds. I love that there are quite a few metallic prints in this too. Meeses and birds and windmills and bicycles and flowers. Drunkards Path and two of the prints I bleached to soften the colours for this quilt. Animals, ballerinas, music, gold sparkly triangles. An HST, a DP and a four square. Postcards, butterflys, girls on swings, pussycats! Alice in wonderland, Kitchen utensils, cookie cutters, bunny rabbits... Pinwheels! 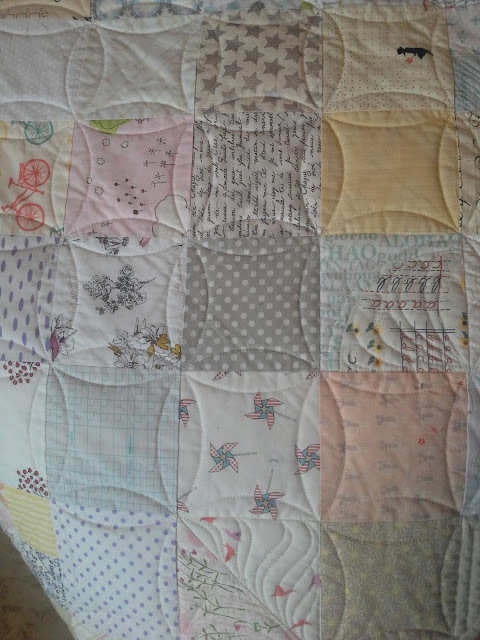 There is so much to find in this quilt, and the quilting itself joins in with the game. I could not possibly love it more. I hope you like it too. I love it. 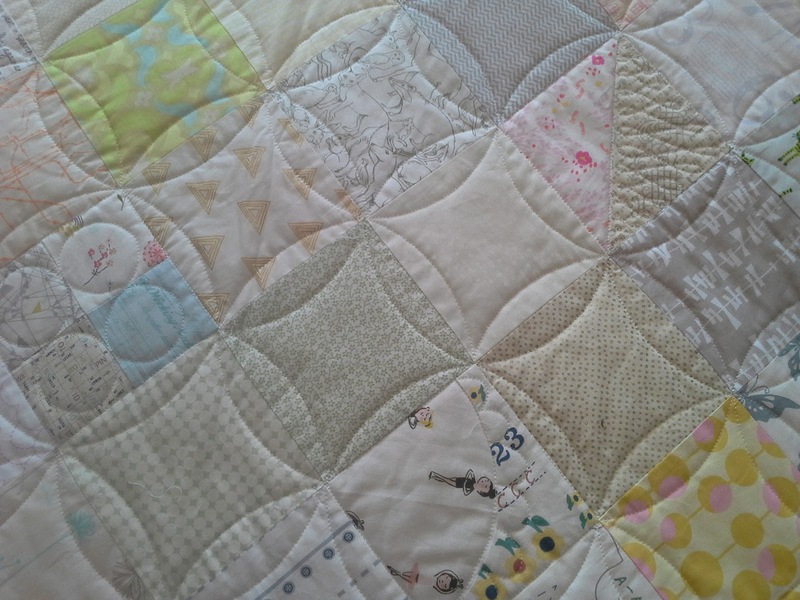 Low volume fabrics remain my favourite kind of prints and your quilt is so special, as it combines lovely fabrics with great memories even at the very beginning of its life as a quilt :) And I love the play of the hidden blocks and hidden quilting surprises. Just brilliant in every way! 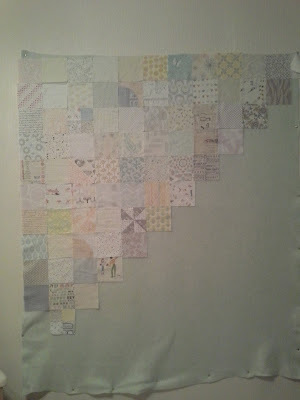 I love the subtle complexity of this "simple" quilt. Great job by you and Trudi. Enjoy all those snuggle times under it! It's so pretty! 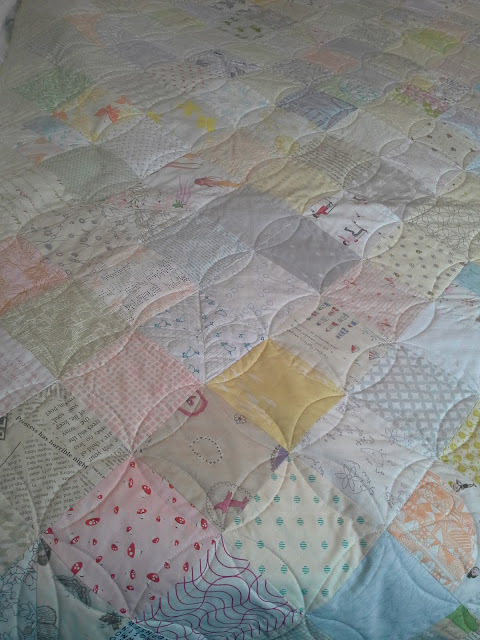 Love that simple but effective quilting!! I can recognise that Alice :) Enjoy it!! 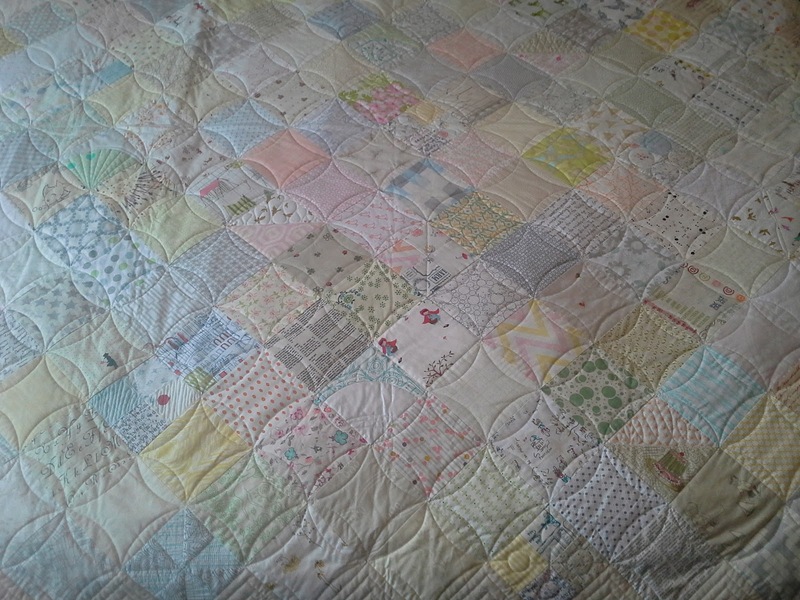 I love it, and I love quilts where the fabrics mean something more than pretty colours to you. It will be perfect for all that snuggling! I can see why you love it - it's as unique as you are Sarah! Oh wow! 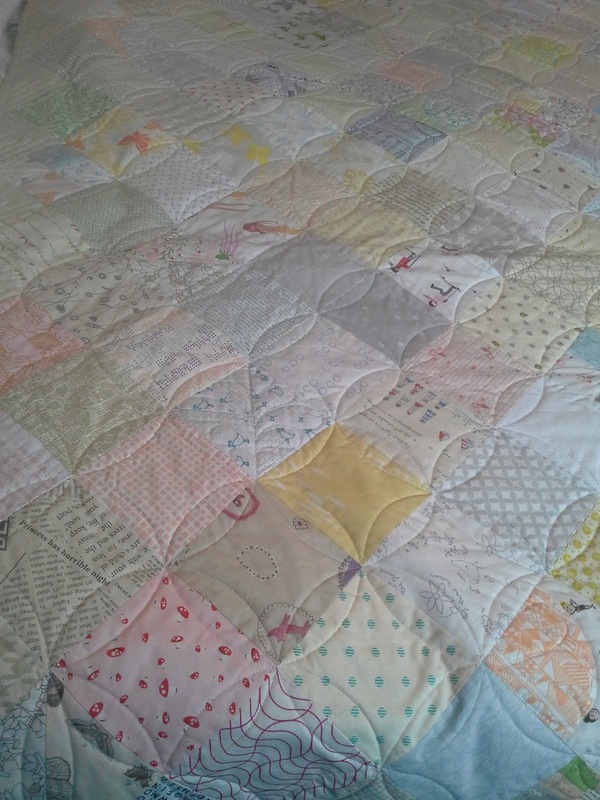 You and Trudie did an awesome job on that, everything is perfect (and well done to super gran for her help!). 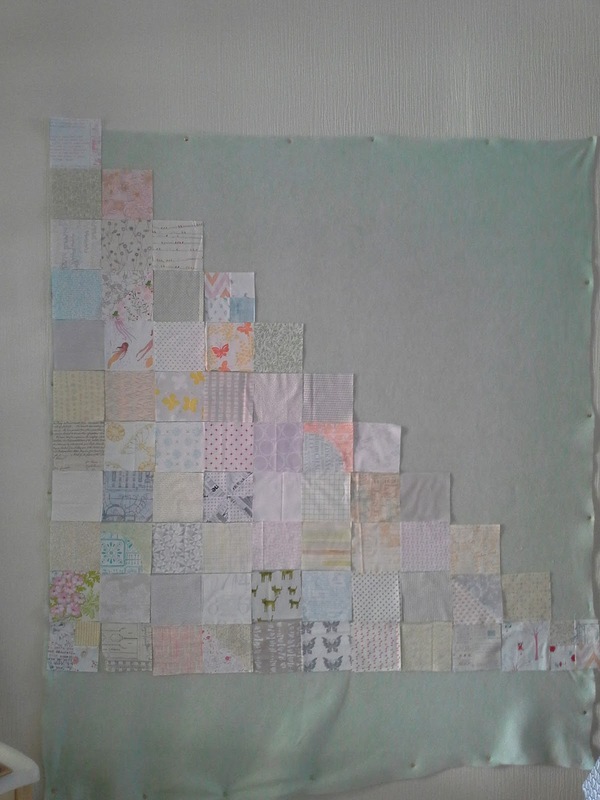 I love the combination of blocks amongst the squares! even tho i am bowled over by bright colors, have to say this is downright gorgeous...perfect quilting pattern too...very, very nice! Am in LOOOOOVE!!!!!!!!!!!!!!!!!! 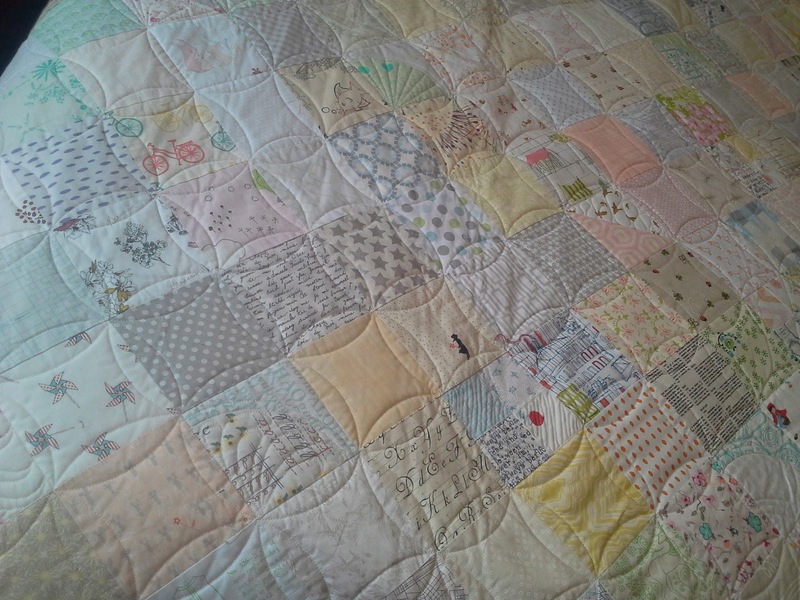 I have serious quilt envy. Oh, it's even more stunning than I was expecting (and that's saying something!) - you must be chuffed to bits with it! 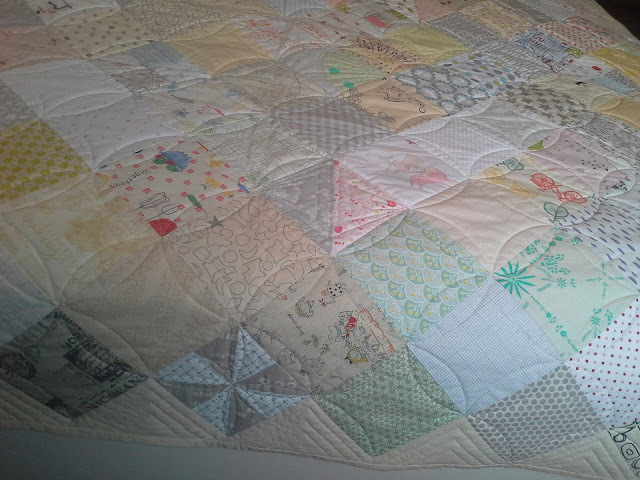 I love all the unexpected blocks and quilting and I bet you and Moo will be finding new things for years to come! Can't wait to start on the non-identical twin!! This quilt is fabulous! I love the way you've included odd blocks here and there, so it's got surprises. Of course the fabrics are special. And I love how the quilting makes the squares look rounder! This is such a success for you! That looks amaaaaazing! So much work and love. Well done! That is the most soothing and homey quilt I have seen in a long time! Well done!!! Beautiful quilt and fun selection of low volume fabrics!